Public corruption has long plagued New Jersey. Now it’s certain to come up in the governor’s race. A week ago, Gov. Jon Corzine was riding high, beaming onstage as President Obama heartily endorsed his re-election. Yesterday, a grim-faced Corzine stepped to another podium to address a very different topic: political corruption — a hammer his Republican opponent, Chris Christie, has been using for months. The allegations leveled against a host of public officials roiled the landscape of an already contentious governor’s race between Corzine and Christie, the former U.S. attorney who built his reputation on sending politicians to jail. While both candidates shied away from talking about the politics of the arrests, officials in both parties said Christie will benefit from the return of corruption to the headlines in a race dominated by the economy. 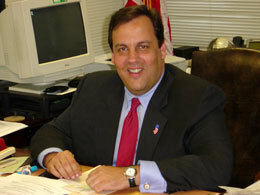 Christie already leads Corzine by double digits in several recent polls. “Christie doesn’t even have to talk about public corruption — public corruption is what people are going to see, hear about and hear more about for the next month at least,” said New York-based Democratic consultant Hank Sheinkopf, who has worked in New Jersey. Posted: 7/24/09 at 1:19 PM under News Story.